I was a very lucky teacher this year to get lots of plants and beautiful bouquets of flowers from my students for Valentine's Day. To show my appreciation, I whipped up some simple cards to send to them. My card base is my favorite for making student thank you notes: Recollections 3.5" x 4.8" cards and envelopes. I love the smaller size and the embossing on them! 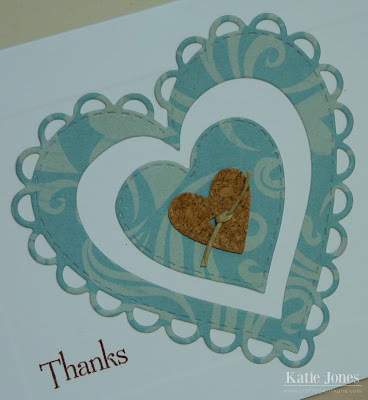 I used the My Creative Time Stitched Scallop Heart Die Set to make my patterned hearts and topped them with a cork heart made with the MCT Stitched Button Dies, tied with a little Thin Hemp from Liz's Paper Loft Boutique. The sentiment is from MCT's Chunky Jar Accessories. I had fun using different scraps to change up the look of the various cards! Your thank you notes are adorable. 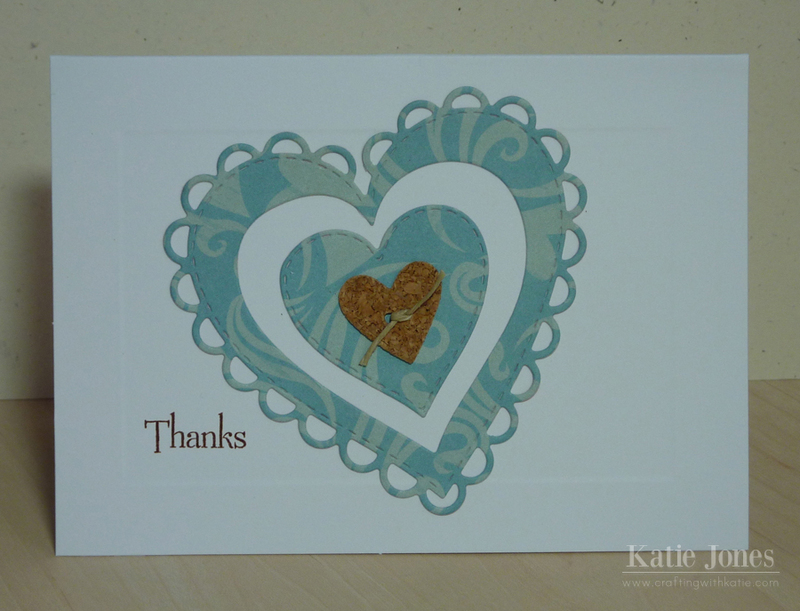 The little cork heart is a nice touch, it adds texture without taking over the card. what a lucky girl to get all those sweet gifts! darling thank you cards, katie! Thanks so much for sharing this. I already had pieces cut out if this die, so I mixed and matched and came up with something similar. These are so quick to make. Ooh, I love these, Katie!!! :) Simple, but oh, so pretty! Perfect for mass-producing. Katie ~ Oh these turned out PERFECT!! So CAS too! I bought those cards because of you and still haven't used them! I LOVE that you use cork ~ again I have because of you ~ with the new button dies!! I bet the students LOVED recieving your TU cards! Plus it just shows with all the flowers how much they adore you!! !